Bella Rosa Books, 9781933523347, 187pp. 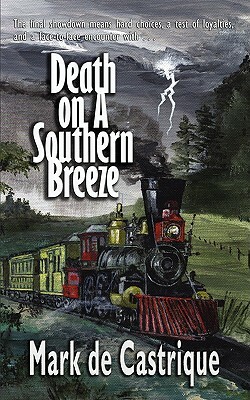 A LOCKED-ROOM YOUNG ADULT WHODUNIT IN THE CLASSIC TRADITION OF SHERLOCK HOLMES A VIEW OF HISTORY REVEALED THROUGH A MYSTERY JUNE 1860 -- A new locomotive christened A Southern Breeze steams across the Carolina countryside carrying seventeen-year-old Jeb Bennett and his twin sister Rachel Leigh to the exhilarating promise of a summer in Charleston. While storm clouds gather over the landscape, fiercer storms rage inside the passenger cars. The tensions between North and South rapidly escalate until one traveler's journey abruptly and brutally ends. Who was the murderer? Was the victim the real target? Amid swirling suspicions and deceptive intrigue, Jeb and Rachel Leigh join Pinkerton Detective Jonathan Ward in a race to unmask a killer. But murder isn't the only evil Jeb must confront. As motives and suspects abound, Jeb learns what it means to place a price on a human life, not only as a victim of murder, but also as property to be traded and sold. The final showdown means hard choices, a test of loyalties, and a face-to-face encounter with Death On A Southern Breeze.